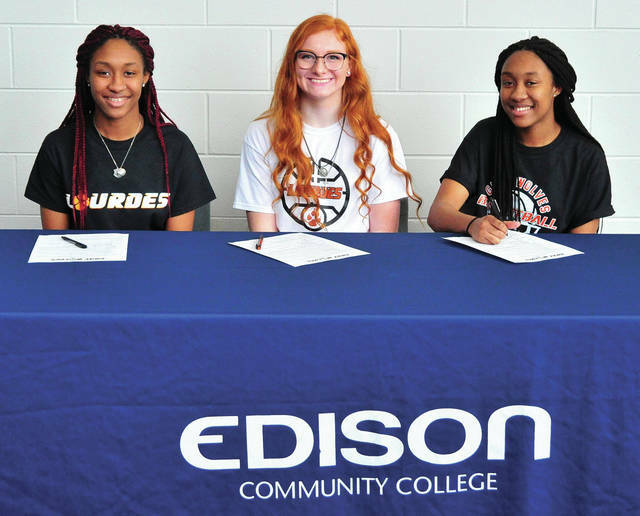 Mike Ullery | Miami Valley Today From the left, Edison State Community College sophomores Kailani Broyles, Lauryn Gray and Kaylesha Broyles signed their letters of intent to play basketball for Lourdes University next season. When Lourdes University women’s basketball coach John Kenger and his team played Edison State Community College in pre-season scrimmage, he got a lot more out of it than he may have anticipated. In fact, Edison State sophomores Lauryn Gray (Piqua) and Kailani and Kaylesha Broyles (Massillon Washington) got his attention so much, he was there Friday as the trio signed letters of intent to play for Lourdes University next season. For Tim McMahon it was a rewarding moment after the trio helped the Chargers to a record 25-6 season. Gray, a 5-10 wing/post, has made great strides over the last two seasons after playing at Piqua High School for one year after moving in. After averaging 3.8 points and 3.9 rebounds as a freshman, she jumped those numbers to 9.8 points, 6.1 rebounds and 1.8 assists as a sophomore. McMahon didn’t mince words about Gray. The Broyles sisters create excitement every time they step on the floor, whether it is forcing mistakes by the other team or creating transition opportunities at the offensive end. Kailani, a 5-6 guard, was an honorable mention All-OCCAC selection both years. She averaged 10.7 points, 3.0 rebounds and 2.3 assists as a freshman and increased those numbers to 12.7 points, 4.0 rebounds and 2.7 assists as a sophomore. Kaylesha averaged 5.5 points, 1.9 rebounds and 1.7 assists as a freshman and improved to 7.8 points, 4.3 rebounds and 3.4 assists as a sophomore. McMahon is not surprised by the two guards’ success. And Kenger is happy to have all three. And the trio are excited to be making the next stop together. After a pre-season scrimmage set things in motion. https://www.dailycall.com/wp-content/uploads/sites/30/2019/04/web1_041219mju_edison_collegesignings.jpgMike Ullery | Miami Valley Today From the left, Edison State Community College sophomores Kailani Broyles, Lauryn Gray and Kaylesha Broyles signed their letters of intent to play basketball for Lourdes University next season.